These 'RCA' audio/video connector Keystone Jacks provide an excellent method of bringing A/V signal connections into any room. They fit into any standard keystone wall plate. Installation is easy and requires no special tools. These jacks have an RCA Female connector on both the front and the back, thus forming a Female-Female coupler. This makes in-wall wiring quick and simple. 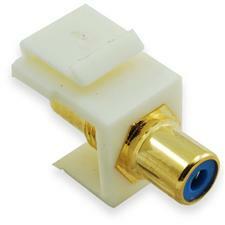 The RCA jacks are available in several colors which are listed below. The Keystone insert portion is white in color.